Proposed legislation working its way through the Florida House of Representatives could eventually lead to high school athletes transferring virtually at will, and it would create a new governing body for high school athletics. On Thursday, the House Education Committee is scheduled to hear the Extracurricular Activities Bill. Under the proposed bill, students would be eligible to play sports at schools outside their designated zone and school district if enrolled by the start of practice for their sport. Join Our March Madness Bracket…. ……and test your skills against other high school sports junkies from across the nation. Over the past 10 years, Alison and Scott Bermack have traveled hundreds of miles—and spent thousands of dollars—to attend gymnastic practices, workouts and tournaments with their son Zachary, now 16. “It averages around $300 a month, year-round for training and that’s not including airfare, hotel rooms and food, uniforms and event fees,” said Alison, a 44-year-old freelance writer with two other children. Good Sam Flyin’ to the Hoop Press Conference Begins The Tournament Season! 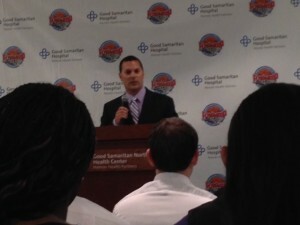 The official press conference for the 2014 Good Samaritan Hospital Flyin’ to the Hoop went without a hitch yesterday, and the buzz of the event is in the air. With 37 confirmed teams playing 22 games over the 4-day weekend, we are excited to offer the audience quite a show! The talent for the 2014 tournament is stronger than ever with 13 different 5-star players on board. For more details on the lineup and talent, check out: http://flyintothehoop.com/. Ticket sales have already begun so make sure to get yours before they are gone! Sports Image® is the parent company of Good Samaritan Hospital Flyin’ to the Hoop. Check out the latest clip from the 2013 Good Samaritan Hospital Flyin’ to the Hoop Skillz Academy. We are thrilled to have had another successful event! We are always happy to do our little part in helping the Dayton economy and we just received word from the Dayton Visitors and Conventions Bureau that the Good Samaritan Hospital Flyin’ to the Hoop event this past January had a $1.9 Million impact on the Dayton area over that 3 day weekend! Sports Image® is the parent company of Good Samaritan Hospital Flyin’ to to the Hoop. Check out this great feature of Good Samaritan Hospital Flyin’ to the Hoop in SLAM complete with stats on the talent and teams participating. The games are just around the corner and we can’t wait to get the competition started! Tune Into ESPN 1410 Tonight! Eric Horstman, President of Good Samaritan Hospital Flyin’ to the Hoop, will be in the studio with ESPN 1410 tonight from 5:00-6:00pm. Don’t forget to tune in for the latest updates and news on the tournament!